The legal registration of the association with a Constitution, under the Companies Act was completed in June 2001. At this time the accounts and secretarial work was also changed to Madapatha & Co and still remains with them. The Executive Committee of the association consists of ., President, President Elect, Vice President, Secretary, Treasurer and 6 committee members., elected annually. The ex officio secretary and treasurer function as the Asst. secretary and Asst. treasurer respectively. All these members work on a voluntary basis and they can be reelected for two consecutive periods of two years each. In keeping with the objectives of WPSA , Education, Research and Organisation the activities are planned and implemented. In organizing the seminars and workshops we have collaborated with government institutions and organisations as well as private companies. The resource personnel for these have been both local and foreign. The participation of foreign personnel has been either through companies or WPSA. WPSA has assisted us to get speakers through the Speakers’ Bureau as well as participation of the WPSA council members. We have had renowned scientists like Dr Rex Guneratne (from Eli Lily) in 2000, Dr Paul Rose from Harper Adams University College, Newport, UK, Dr D Narahari of University of Chennai, India, Dr Milind Limaye, Dr Vaibhav Nagpal from India, Dr R K Pathak and Mr Deepak Khosla from VHL India, Dr Sylvan Comte of Ceva Animal Health, Dr Eugenio Rojas from Aviagen group, Dr Hadden Graham from Finnfeeds, Dr Helmich and Dr Ernst from Barneveld College in Netherlands, Dr C B Pande from India and Dr Chin How Cheong, International Consultant and our own founder member, who always updates us with the current poultry situations. We have had the honour of having many WPSA Council members as resource personnel as well as visitors. Past Presidents, Dr Peter Hunton, Dr Piet Simons, Dr Rudey Akbay, Dr Roel Mulder and the president of the Asia Pacific Federation Mr Allan Gibbins have all been our honoured guests at different times. Now today we have with us the President , Dr Edir Nepumeceno Silva. From humble beginnings, starting with meetings and seminars at small places, now thanks to the untiring efforts of our members and poultry industry stakeholders, who generously sponsor many events, the association within these 15 years has grown to an extent where we can hold the seminars technical sessions etc at grand hotels and host international guests. Another activity initiated by the association was the donation of Eggs to IDPP through the Ministry of Livestock and Rural Community Development in 2009. Our members have participated in the First South Asian Poultry Conference, in Pune India in 2001, Asia Pacific Federation Conference in Bangkok in 2007 and the World Poultry Congresses in India in 1998, in Australia in 2008, and Brazil in 2012. In 2012 March a group of farmers and members from the branch visited ILDEX Exhibition in Bangkok. This together with some farm visits in Bangkok was arranged by the branch. 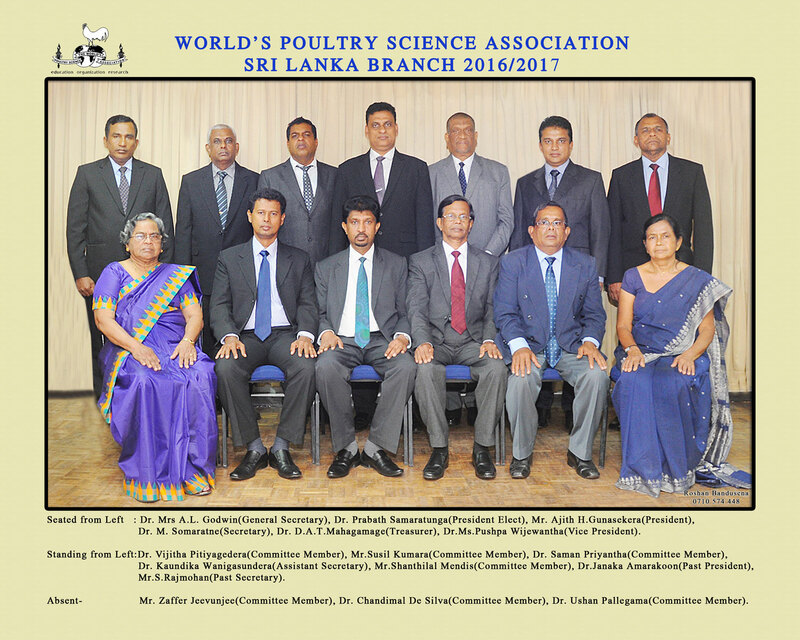 World’s Poultry Science Association - Sri Lanka committee members for 2016-2017.